The tiny Willow station was not part of the original plan of the Northwestern Elevated Railroad as built in 1896-1900. The addition of a station at Willow Street was included in the franchise provided by the city to build the Northwestern Elevated's Ravenswood branch, as was the addition of a stop at Oak Street. Although these stations were not located on the new branch, the city used the Northwestern's desire for permission to build and operate the new spur as leverage to force the "L" company make the otherwise unrelated improvements. Willow station opened in 1905. 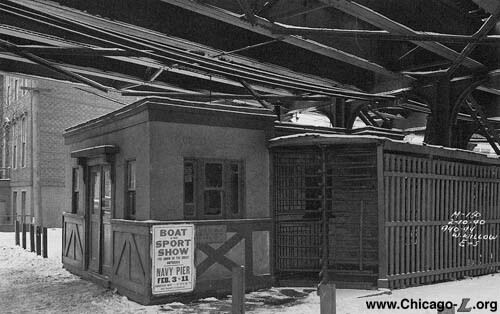 The station house was located on the north side of Willow Street, underneath the elevated track structure at the edge of a bend in the right-of-way. The small station house was more than adequate for the modest neighborhood walk-in traffic that this station handled. The one-story headhouse had influences from the Craftsman architectural style. The exterior walls were clad in plaster with a half-timbered treatment on the lower half of the building and an ornamental hood over the front entrance. An ancillary exit corridor with rotogate along the side of the building exterior provided improved circulation by separating entering and exiting traffic. Willow featured dual side platforms, constructed of a wood deck on a steel frame, projecting northward from Willow Street immediately beyond the curve in the elevated structure. The platforms featured canopies at the far south ends, covering the stairs from street-level. 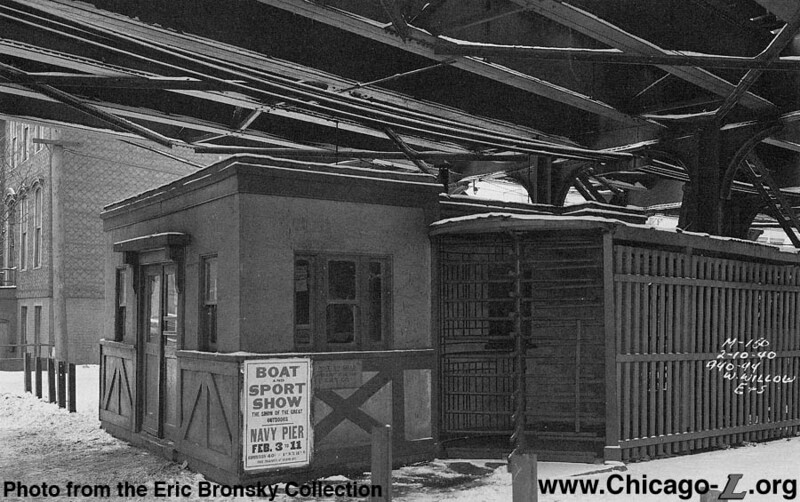 The canopies, which were similar to those built for the Ravenswood branch stations, featured a gently arched roof with curved support columns and latticed framing. 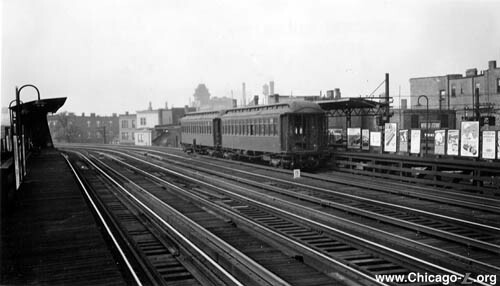 The station was generally similar to the Ravenswood branch elevated stations built two years later, albeit on a smaller, more modest scale and with some simpler materials. The station had an unremarkable history for the next several decades, serving mostly local walk-in traffic from the surrounding apartment houses and from the industries to the west. 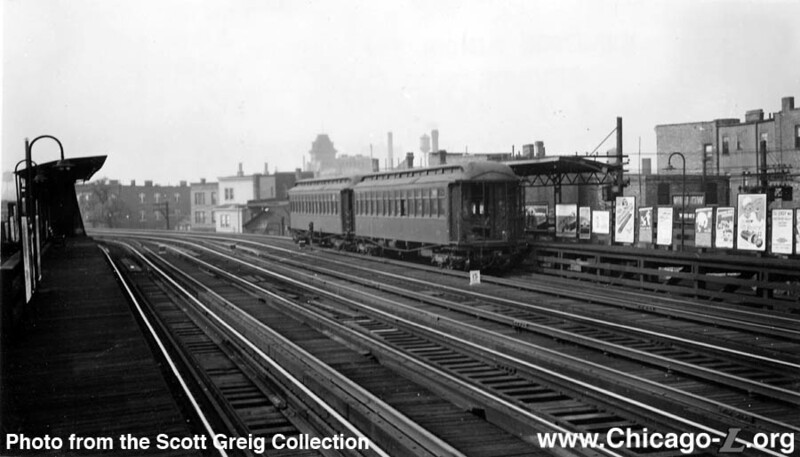 In the late 1930s, planning commenced on Chicago's first subways, funded by federal dollars made available by President Franklin Delano Roosevelt's New Deal programs during the Great Depression. Route Number 1 of the Initial System of Subways, the State Street Subway, would ascend to the surface and connect to the existing elevated tracks just north of Willow Street, requiring the removal of Willow station and reconfiguration of the elevated structure there. On July 30, 1941, the Chicago Rapid Transit Company filed a request with the Illinois Commerce Commission for permission to abandon Willow station to accommodate construction of the subway. Approximately 400 people daily boarded trains at the station at that time. The ICC granted the CRT's request with an order dated October 29, 1941. 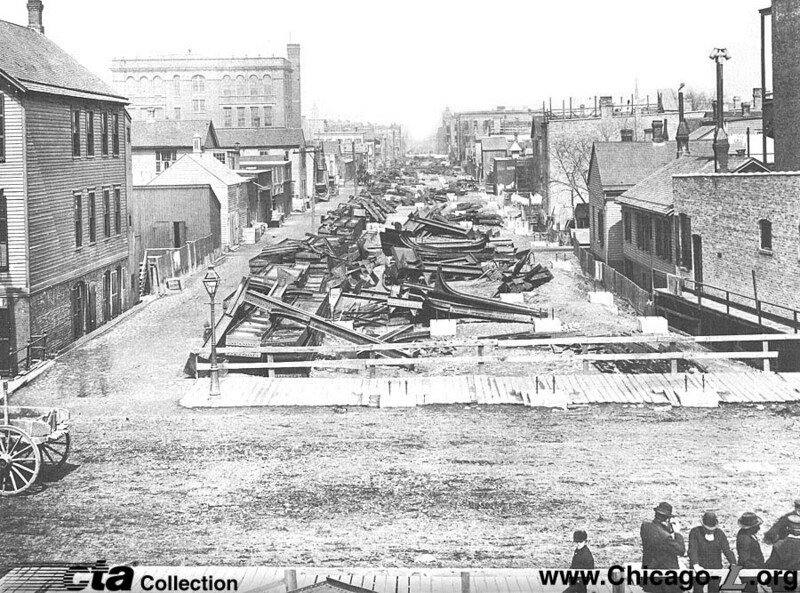 Willow station closed at 7am, Sunday, May 17, 1942 and was quickly demolished to accommodate the connection to the State Street Subway, which opened in October 1943. Today, no remnants of the station remain.